Less than 175 m from the beach, Villa Kas Abou is the perfect Blue Bay vacation villa. Villa Kas Abou is an attractive and comfortable villa located in ‘The Village’ area of the famous Blue Bay Beach and Golf Resort – one of Curacao’s premier vacation destinations. Perfect for either families or small groups of travelers, the villa enjoys an attractive, well-appointed interior, and has a perfect location that’s close to a range of amenities and beauty spots. Villa Kas Abou comfortably accommodates up to 6 people, with 3 bedrooms, and a generous 1800 square feet of single-story living space. The villa features an attractive, family-friendly layout, with the kitchen and the main living area inter-linked. Among the very best features of this Blue Bay vacation villa is the beautiful veranda, which wraps around two sides of the building. 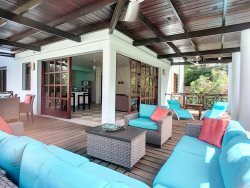 With its columns, wooden ceiling, and decking underfoot, the veranda adds a charming colonial feel, and is the perfect place to sit and luxuriate in the warmth of the Caribbean climate. The vacation villa’s 3 bedrooms each sleep 2; the master features a private en-suite bathroom, while the second bedroom has direct access to the neighboring bathroom (which doubles as the primary bathroom for the villa, and is also accessible from the hall). 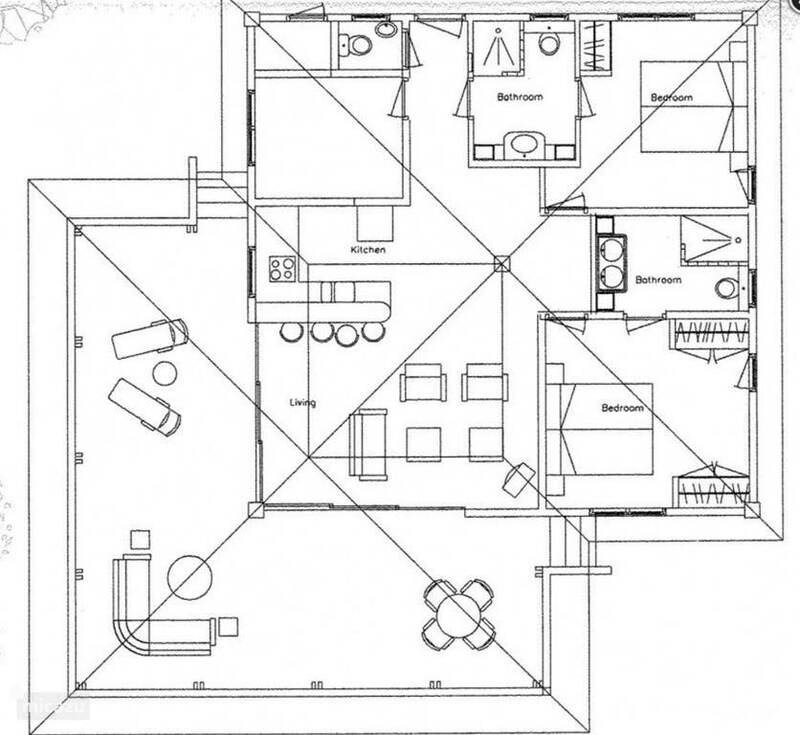 The third bedroom is a twin, with 2 single beds, and benefits from having a small washroom, complete with toilet and handbasin, directly next door. The villa is light and bright throughout, with tiled floors, and richly colored wooden windows, doors, shutters, and furnishings that add an attractive contrast to the light décor. As a well-equipped Blue Bay vacation villa, the property includes a number of home comforts, each added for the convenience and enjoyment of our guests. After a day exploring Curacao, you’ll be pleased to relax in front of the villa’s smart TV, complete with Netflix and Amazon, or connect with jealous friends and family back home, thanks to the villa’s Wi-Fi. Keeping cool is easy, since the villa includes both air con and overhead fans, while appliances such as hairdryers, an iron, and a number of everyday essentials are provided. These include fresh white towels and bed linen, soap, shampoo and toilet paper. This family-friendly villa also includes a few extras for children, such as a high-chair and travel crib, as well as board games, children’s plates/cutlery, and kids’ books. The kitchen includes a stove, microwave/oven combi, dishwater, kettle, coffee maker, blender, and all the utensils needed for day-to-day cooking. You’ll find tea, coffee and sugar ready and waiting for you, and with shops and supermarkets nearby, stocking up with extra provisions during your stay is easy. Blue Bay Resort caters perfectly to the needs of every visitor to Curacao. Its white-sand beach is often named as the best on the island, and offers the ideal place to bathe in the Caribbean sun, or swim in the azure waters of the Caribbean Sea. Diving and snorkeling are experiences not to be missed – especially as the many nearby reefs are teeming with an array of marine life. The nearby PADI diving school makes it easy for newbies to experience this once-in-a-lifetime thrill! The resort also features its own 18-hole golf course – among the most beautiful in the world, as well as tennis courts, a kids’ club, and a choice of excellent restaurants, serving both Caribbean and international cuisine.